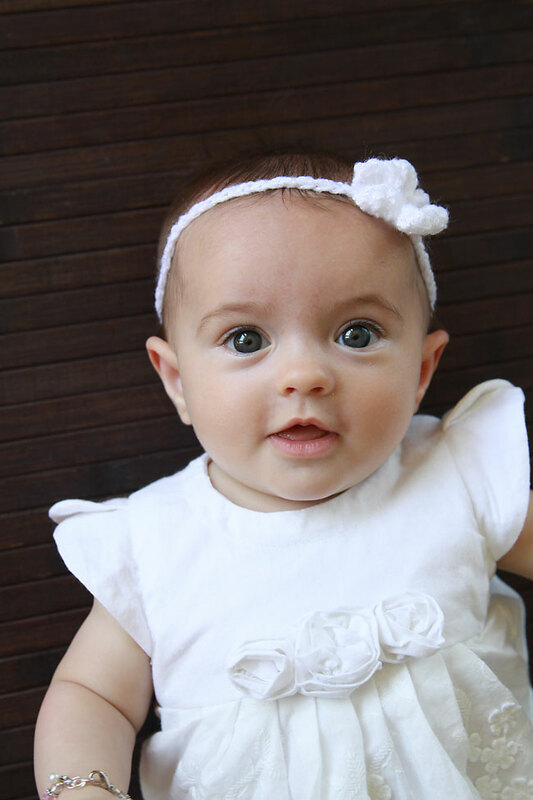 It can be hard to take professional looking photos of babies – babies who can’t sit on their own often looked scrunched and uncomfortable in photos, and by the time they can sit, most babies can also scoot, meaning they’re not interested in sitting still for photos! 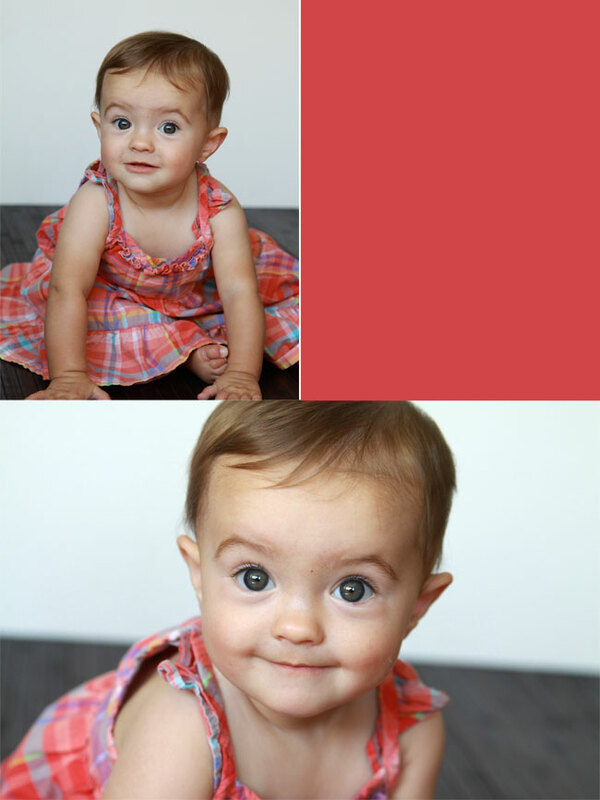 Photographing babies is hard, so I’m sharing the things I’ve found that work best for babies at different ages. Most of the photos we take of babies show them sitting in something, whether it’s a carseat, bouncy seat, or someone’s arms. 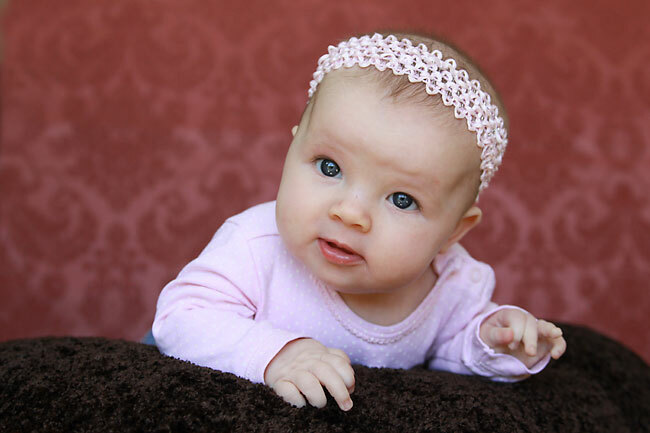 That’s fine for a snapshot, but for a more professional looking photo it’s best to find a way to photograph the baby in front of a plain, neutral background that won’t be distracting in the photo. My favorite way to photograph babies who are a little older but not yet sitting unsupported in to lay them down on the floor on their back. 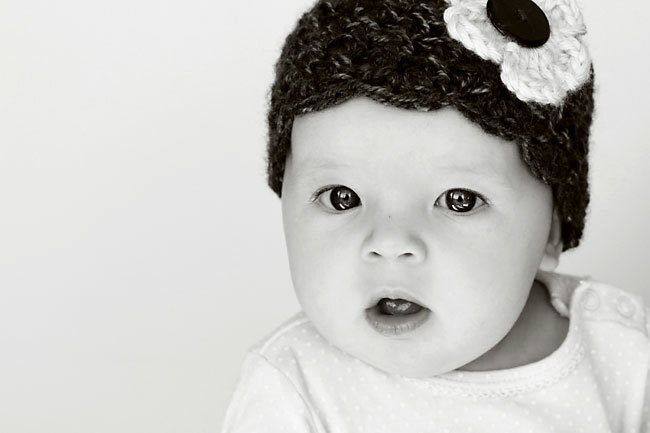 You can stand directly above the baby and talk to her to get eye contact and a really natural expression, along with a nice neutral background (use a blanket, rug, or bamboo rug like I used here). Just BE SURE to shoot from directly above the baby’s eyes (stand on a chair if you need to) instead of standing at the baby’s feet – look how much nicer the 2nd photo below looks than the 1st one. I’ve listed this position for babies 3-6 months old, but it actually works great for all ages. If you’d like to use this pose for a very young baby, swaddling him tight will help him feel secure. 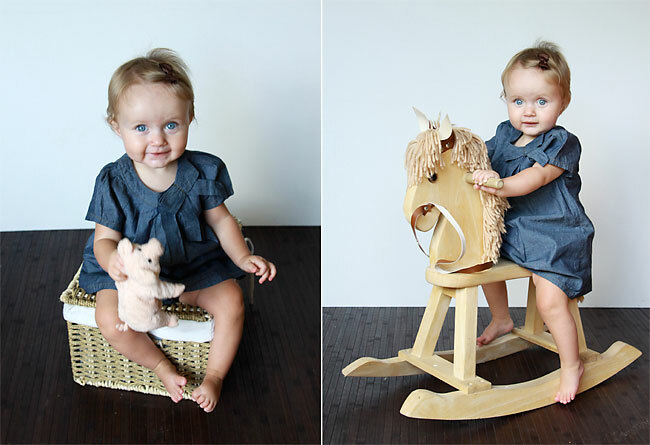 If you use it for an older baby, plan to work fast before she rolls over and crawls away! 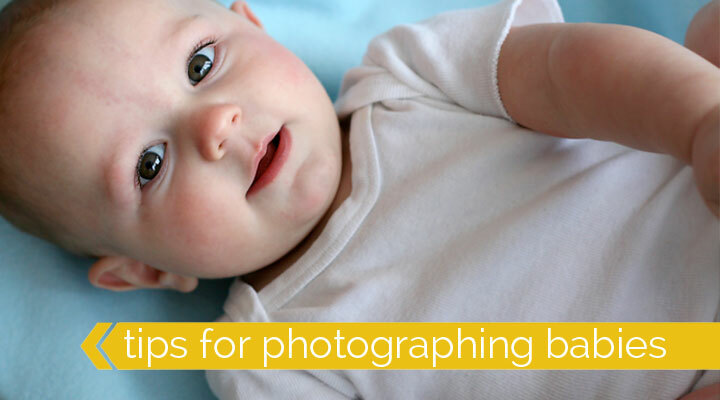 Just remember that if you are taking pictures of a baby who is sitting on the ground, you’ll need to be sitting or laying on the ground as well so you can shoot at her eye level. If I had been a little lower when I took the photo above the background would have been plain white. 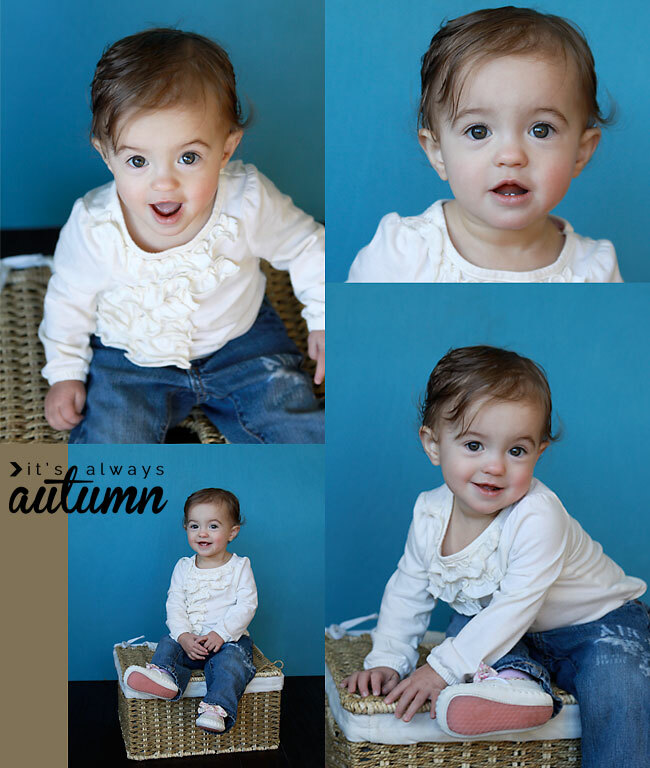 Another option is to help an older baby stand by sliding a chair or other support into the photo. She’ll be so proud of herself for standing that she might not try to crawl away immediately. 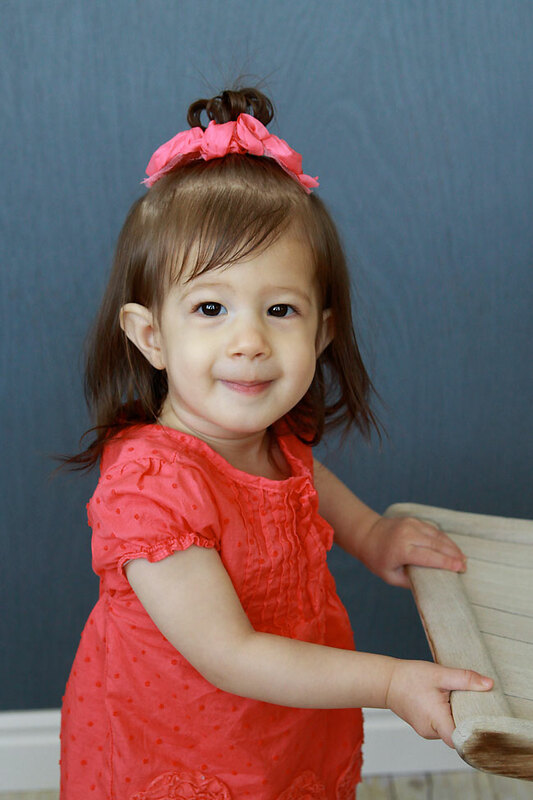 Choose a neutral colored chair so it doesn’t distract from the photo, and remember to sit on the ground so you can shoot from her eye level. 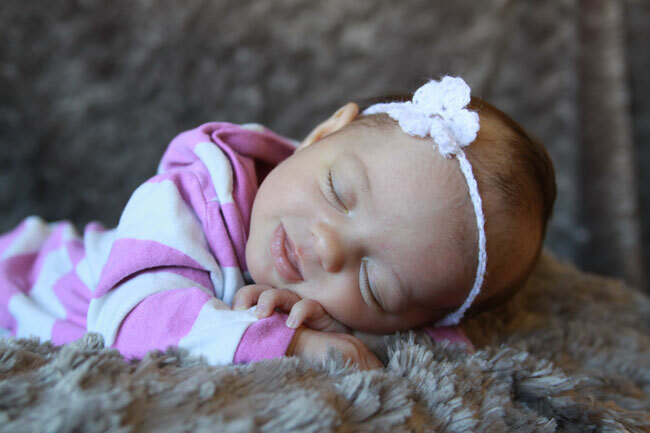 Remember that it’s a lot easy to reposition yourself than it is to reposition the baby, so once you find a pose that works, get as many photos from different angles as possible. Talk, sing, or giggle at your baby so he’ll be more likely to stay still and look at you, then take as many photos as you can – you may only have a few minutes before the baby starts to cry or tries to crawl away. (Shaking a rattle or musical toy can be really helpful.) Zoom in for closeups and zoom out for full body shots. Get low to shoot at baby’s eye level, then take a few from above. 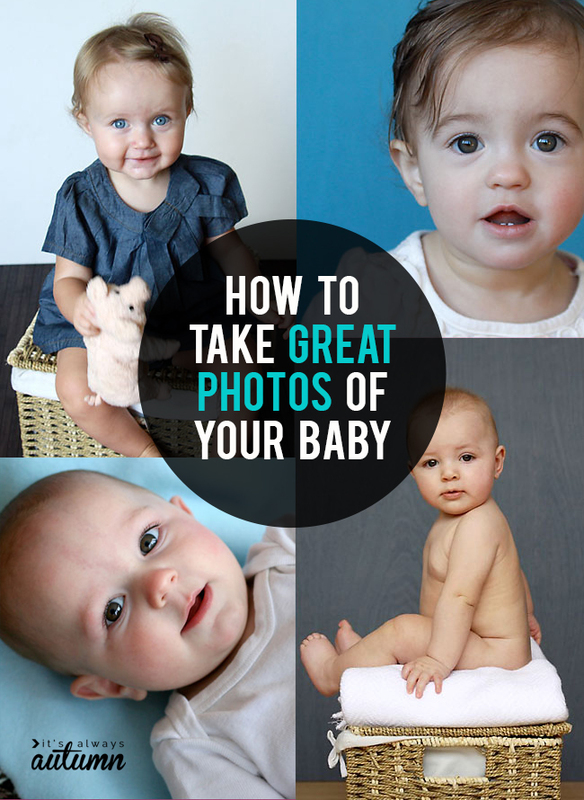 Get pictures from as many different angles as you can so you’ll end up with photos that look different even though you didn’t move the baby. Be ready to work fast, and remember that if it the photoshoot doesn’t go so well the first time, you can always try again! 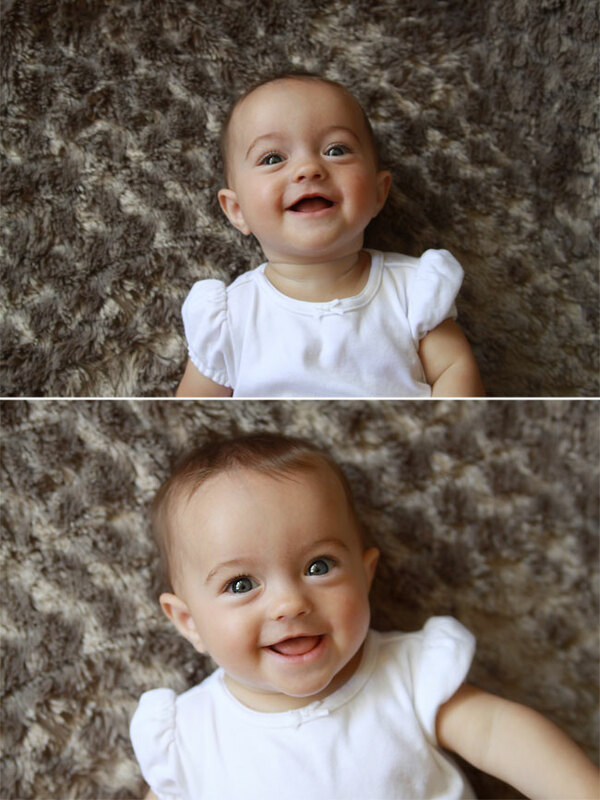 If you can’t get a smile today, plan to try again tomorrow when the baby is in a better mood. Practice really does help. I love each and everyone of your posts. Thank you for taking the time to teach us so many things. Beautiful pictures and great tips. Great tips! I’m going to share these with my husband.